Yorker spouts are ideal for pinpoint liquid dispensing. Natural color polyethylene with red spout sealing caps. Fit 400/410 neck finish. Supplied with .030” hole in spout except for 38mm size, which is .090” and are unlined. Pull/Push Caps are perfect for no-drip dispensing of lotions and soaps. White unlined polypropylene base with white polyethylene spout. 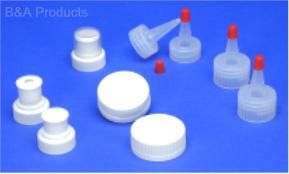 Overcap style has clear polypropylene cap. Child-Resistant Caps are white polypropylene with F-217 liner.